Oh, happy day! As some of you already know, today, March 19th, is the feast day of the Christ Child’s earthly Father, St. Joseph. Celebrated in towns and villages throughout Italy, the life of this humble carpenter is especially commemorated in Sicily, where it is believed his intercession saved the island’s inhabitants from a drought-induced famine during the Middle Ages. Today, in the States, his feast day is remembered wherever an Italian community calls home. Here in the Bartolini kitchens, we celebrate St. Joseph with music. In years past, we assembled a band and sang a song. All that’s left to do is dance. Since today we celebrate Sicily’s Patron Saint, why not feature a dish from that beautiful island? 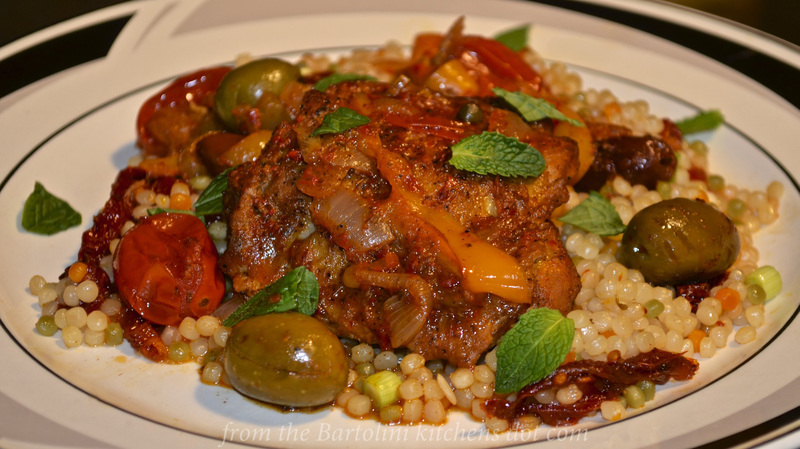 That’s a great idea, though I doubt that this dish is actually Sicilian in origin. Chances are it’s an American-Italian creation, if that. Well, at least half of its name is Italian, strata being derived from the Italian word for layer, strato. As its name suggests, a strata consists of layers of ingredients and these are held together with a custard-type mixture. Strata come in many flavors. When Zia’s youngest Son’s family comes for a visit, ofttimes 3 of her Grandsons will work together to serve brunch. One mans the smoker while the other 2 bake a strata and prepare a few side dishes. They perform like a well-oiled machine and no one leaves that table hungry. With a Sicilian strata, it’s all about the sausage, so, be sure to use your favorite Italian sausage, or homemade if you have it. You’ll find that today’s recipe is relatively benign but you can spice it up as much as you like. This can be easily accomplished by using “hot” Italian sausage, sautéing diced hot peppers with the vegetables, and/or seasoning the vegetables with red pepper flakes. 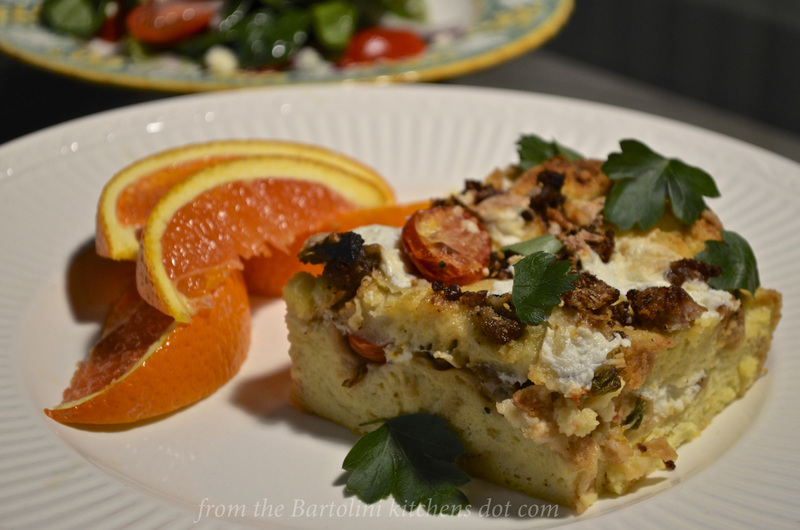 Your strata may be served hot or at room temperature, making it perfect brunch fare. Assemble it the night before and bake it anytime before your guests are seated at the table. Add a salad, some jam for bread/toast/bagels, perhaps some fruit, and brunch is served. Best of all, instead of being stuck in the kitchen playing short-order cook, you’ll be sipping Bloody Marys with your guests. In a large frying pan over med-high heat, sauté sausage meat until browned. Remove to a dish and reserve. In the same pan, sauté mushrooms until just about cooked through, about 5 minutes. If needed, add some additional olive oil. Add the onions and peppers to the pan and sauté until soft, another 5 minutes. Return sausage to the pan, mix, and heat through. Remove from heat and reserve. In a large mixing bowl, whisk together the eggs, milk, salt, and pepper until well-combined. Use oil spray, vegetable oil, or butter to lightly grease a large baking dish. Cover the bottom of the dish with a layer of bread slices. Sprinkle half of the sausage mixture over the bread. Add half of the tomatoes. Sprinkle half of the grated Pecorino Romano cheese on top. 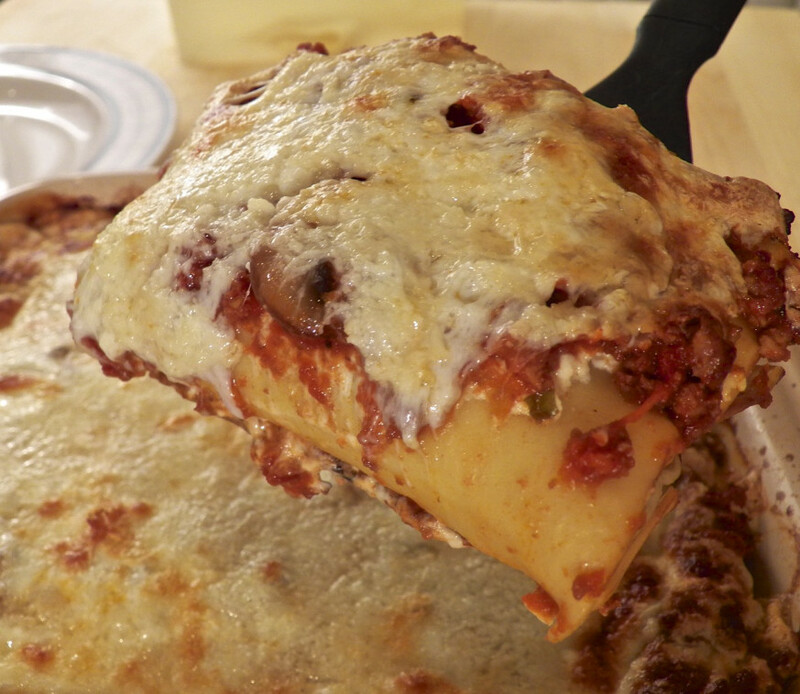 Finish this layer by adding half of the mozzarella cheese. Add another layer of sliced bread. Cover this layer with the remaining sausage mixture and tomatoes. Carefully pour the egg mixture over the top of the entire dish. 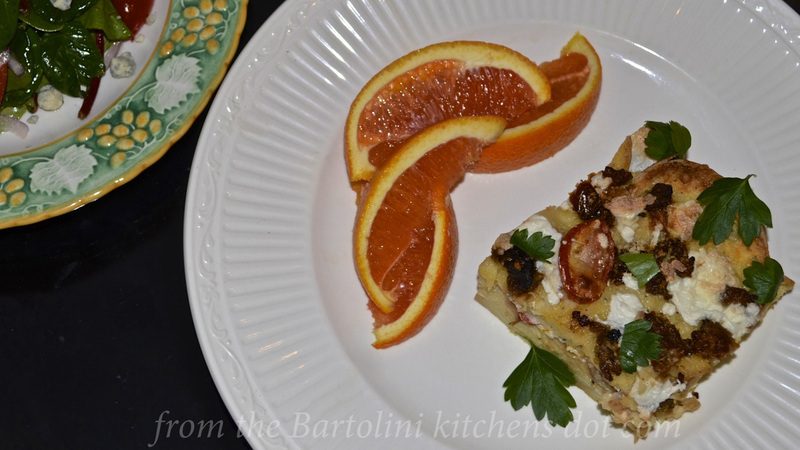 Finish the strata by sprinkling the rest of the Pecorino Romano and mozzarella on top. Cover and refrigerate for at least one hour or overnight. Pre-heat oven to 350˚ F (175˚ C). Allow to rest for 5 to 10 minutes before garnishing with parsley and cutting into squares for serving. Still not quite what you had in mind? Then head on over to my blogging friend Nancy’s blog, Feasting with Friends. Just days ago she posted a recipe for a strata with Ham & Asparagus and it sounds delicious. Use whatever sausage you like, though Italian is suggested. It is a Sicilian strata, after all. I use our family sausage though you might prefer something a little sweeter or a bit more spicy. If using links, be sure to remove the sausage meat from the casings before cooking. If using fresh mozzarella, it will be much easier to grate if you place it in your freezer for 30 to 45 minutes before grating. As you may have seen in the photos, 8 oz of fresh mozzarella, when grated, will not result in enough mozzarella to completely cover each layer. Use more if that is what you prefer. In Summer, I use a couple of “regular” tomatoes that I chop before adding to the strata. Being this is Winter, good tomatoes are practically impossible to find here, so, I use cherry or grape tomatoes that I slice in half. Use the best tomatoes you can, given the season. The amount of salt you use will depend greatly upon the sausage and cheese you’ve chosen. Both can add quite a bit of salt to your strata. Allowing the strata to come up to room temperature before baking will reduce baking time. As a precaution since you’re using raw egg, do not let the raw strata sit unrefrigerated for more than a half-hour, especially if you’ve a warm kitchen. Since we’re in a celebratory mood, I thought today’s blast from the past should take us back to a recipe that was shared to commemorate a previous St. Joseph’s Feast Day. 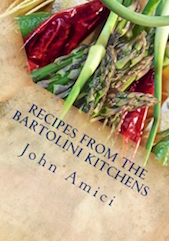 It was just about a year ago that I showed you all how to make Bartolini cannelloni, affectionately labeled a crown jewel of the Bartolini family recipe book. For a refresher course, all you need do is click HERE.